Have you been watching the new show “Home Town” on HGTV? It claims a space on my DVR schedule so I never miss a makeover. I love a good porch, so it was fun to see how Ben and Erin Napier added one to this small white house in Laurel, Mississippi. Known as the Polk House, it was cute to begin with, but the new porch gave it the extra bit of Southern charm their client Amanda Matthews craved. Take a look! It’s great to have some outdoor living space with a smaller house. The whole house looks cozy and feminine. Ben & Erin also gave us a tour of their charming cottage in Laurel a few years ago, before they became TV stars, and it continues to be one of the most popular posts on my blog. For more photos and information about the Polk House (now Matthews House) makeover, visit HGTV. Hey! It’s great to see your blog in the a.m., just like old times! I’ve recorded all the Home Towns, + now I see that it’s high time I sit + do some binge watching, stat! I love the re-do of this house, + I may use their railing design when we finally finish our own front porch. I, too, loved Brooke Giannetti’s former house, + their new farm is so good, it’s positively otherworldly. 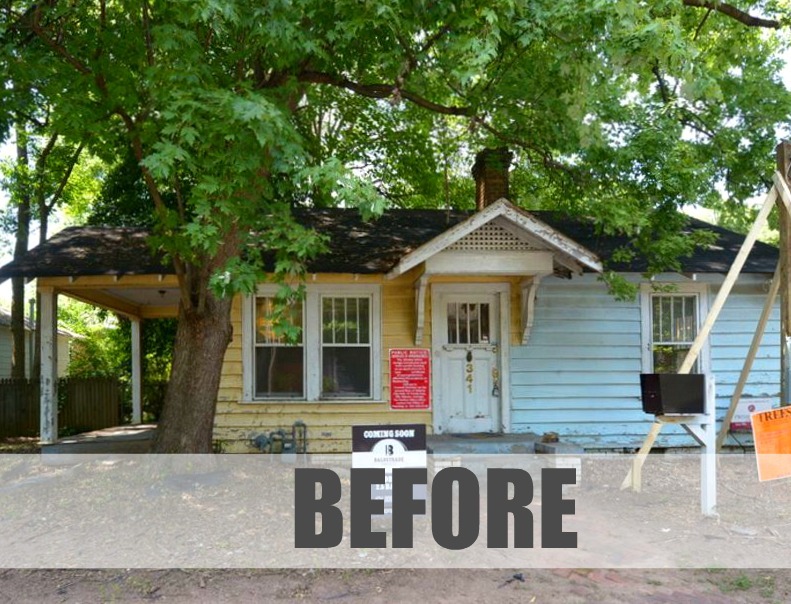 That is a really great makeover with the porch and redo of the kitchen! Very charming! Look at those plates on the living room wall!!! LOVE them!!! I love this show! Erin and Ben seem very genuine, and very talented. Beyond the beautiful work they do, I love the fact that they showcase local artists, craftsmen, and small businesses, so that you get a real feel for life in the south. My summer vacations as a child were spent visiting family in Alabama, so this show is like a hug from the past! I enjoyed this post very much. A very charming addition and remodel! Porches are wonderful and the scale works well here. Though there is a conversation to be had (and I believe you have had it!) whether to have a closed or open kitchen, the new kitchen here is well done and feels like a breath of fresh air. I so appreciate that you keep up with your blog from time to time as it is such a favorite of mine. Hope you are recovered and feeling much better and enjoying your other interests. My best wishes are with you always, Julia! I so happy when their pilot got picked up on HGTV! I really loved watching this past season of “Home Town” and they are such the sweetest couple. We even stopped by their store in Laurel, MS on our way back home to VA last month. They weren’t in the store that day but we chatted with a very nice employee who told us they are hoping that HGTV will pick them back up for another season. So if you love their show, let HGTV know! I love their show. Not be rude, but I am under whelmed with Fi**r U**er. I also love Good Bones and am thrilled that it is back. Both these shows do make overs just a little different. Do we all need ship lap? Hi, Jane, I can’t agree more with you on the show Fi**r U**er. So tired of juvenile Chip & time spent on their farm & kids. Home Town is a superior show with 2 very talented artists. Good Bones is a favorite of mine too. I can’t resist, you are not my sister Mary? ?. Just kidding, but thanks for your reply. Erin and Ben are totally delightful. Adorable… those two work miracles. Although, the house had some sweet curb appeal before with that delicate hand rail and soft yellow door. I agree, Sarah — I thought it was pretty cute to start with! Everyone’s going to hate me: I like the Before kitchen. I’m tired of the tearing down walls thing. I’m in a place with an old kitchen, and I am so glad the owners didn’t “open concept” it all before I moved in. My next house, I would like to find one that hasn’t been gutted. Is there any hope for me? Sigh. I agree with you about the “open concept” requirement these days. Why can’t old houses stay intact? I do love the style of the new kitchen, but it really could have stayed a separate room. I love this show. My favorite house, though, was the one where they did French country inside. The kitchen was the best. Love this show. And I love how they make each home look different! I absolutely love this house. Thanks for sharing it. I love your blog! I love the kitchen. So adorable. I bit too open concept for me, though. I like walls for art. And this show introduced me to a cool artist I’d never heard of. However, I have to laugh when the wife calls herself an artist and presents a water color to the people whose house they’ve redone. The three or so I’ve seen all look like something a child would have painted. I always want to say “Aw, bless her heart.” She’s seems to be a nice lady, but only a borderline artist. I like the Polk House before they “tacked” that porch on it. To me, the porch is too big for the house. It looks like it’s going to tip over. l like porches, but they should have added a smaller porch or left the house alone. But the home owner requested a porch. I love this! I would have kept the front door yellow though. The whole house is so soft and lovely. I didn’t mind the original exterior at all, but the porch looks great and I’m sure it will get good use. Everything else they did was lovely…….I like the fact that they made “big” changes, without those changes being so BIG……if you get what I mean. In other words, they did not turn the house inside out and stretch it in every direction possible…….they maintained it’s dignity and integrity. She was just a nice old lady who needed a bit of TLC and respect to buff up her original good looks. She seems very pleased with herself right now! If by some chance any of my children are reading this then YES! There’s a lesson here. Call your Mother. In fact, call her and invite her to dinner. Put the porch on the back and leave they classic front alone. good idea, Lynne, I agree. I want that first little house! Glad to see this site is going again! 🙂 Happy summer! Hi Julia! I’ve missed seeing you in my inbox! I love that Erin and Ben’s designs enhance the existing structure without overwhelming it. They take careful consideration of their client’s needs and the bones of the house. So far, HGTV has not turned them into one dimensional characters like “Shiplap and Goofball.” A lot of what I dislike about the HGTV stable of shows is that they take a few elements of a host’s personality and beat it to death. The formula is tiresome. Now this house? I actually like both the before and the after. The added hardwood floor to the kitchen is a stunning update, but the open concept is too modern for the house’s bones. The porch makes it a different style entirely—not a bad thing, just different. I must confess that I must be the only person who dislikes Home Town. As a Southerner, something about the overplayed “Southerness” feels artificial and trite. It doesn’t read as real. I love Good Bones and like the occasional Fixer Upper, though shiplap is getting a bit too much. Love the diversity of styles Home Town and Good Bones are bringing to HGTV’s roster, though. Oh! I meant to add, if you’re looking for some new house eye candy, check out the Starlight Village development outside Austin. The builder is doing a MCM community of new homes. Their posts are fun to follow on Facebook, even when they don’t get the MCM perfect (tossing in some contemporary or modern, for example). I hadn’t heard about that. Will check it out — thanks, Brandy! I love love this blog. I am a true house lover and enjoy very much seeing the before and afters. I disagree with Brandy, I too am a Southerner, born and grew up in Mobile, Alabama. As an adult I lived in Chicago for many years and now living in Houston Texas. There is an air and sense of community, gentleness and soft southern accents that I love seeing and hearing in Home Town. I am so pleased that HGTV has it as a part of their lineup.